This fifth installment in OCEG’s Anti-Corruption Illustrated Series addresses anti-corruption investigation programs. Every organization should have a strong anti-corruption program that includes detection systems and processes and a response plan to assess, investigate and resolve issues. 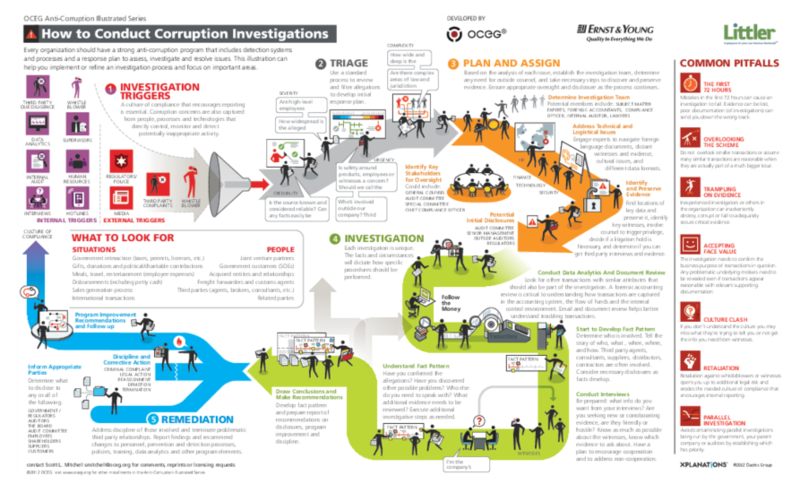 This illustration can help you implement or refine your investigation process. We have emailed instructions to access Illustration – Anti-Corruption Series #5 – How To Conduct Investigations Of Corruption to . Make sure the email arrives in your inbox: either add "support@oceg.org" as a safe sender to your email platform, or if you use Gmail, drag our email into your Primary tab.